The rabbis talking with the twelve-year-old Jesus about the Torah must have thought that he was a child prodigy. There have been such, and as a proud pastor I delight in the extraordinary skills of so many of the children in our parish, so adept at piano and violin and so forth. “Prodigy” means a sign or a gift. Betraying a prejudice, I’d propose that in addition to the five ways St. Thomas Aquinas proved the existence of God from natural evidence, prodigious Mozart would be a sixth. You cannot compose a symphony at the age of eight and ascribe it just to chemistry or biology. 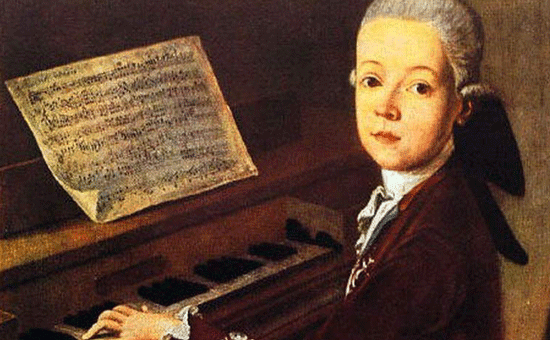 A nice thing about Mozart is that he was nice. People liked him, and he liked them, and he did not storm about like the self-styled geniuses of the romantic period a couple of generations later. He thought of himself as a craftsman who enjoyed his craft. Simple as that. But he never produced anything second rate, which is why I propose him as proof that there exists a God who does great things through his creatures. Mozart said that music is not in the notes but in the silence between the notes. That might sound like a nice throwaway line, but he meant it, and his music is proof. So it is with our daily lives: God is to be heard in the silent spaces between all that we say and do. Jesus cannot be filed away in the category of child prodigies. He is the source of all prodigy. At the age of twelve in the Temple, he called it his “Father’s house.” In him was more than genius. It is true that great artists, like Jesus himself, give the impression that what they do is effortless. The Latin phrase ars est celare artem means that the essence of art is to give the impression that it is easy. Great opera singers would have you think that their sounds are effortless. Compare that with the rock singers who affect an air of pain when they scream into sound amplifiers, as though they (and not their listeners) were enduring some form of torture. It is their attempt to make you think that their artlessness is art.